Even halfway around the world, Germans had trouble playing nice during the early 1930’s. A small handful of German expats tried to establish new homes on Floreana, an island in the Galapagos archipelago. What they lacked in numbers they made up for with sheer prickliness. 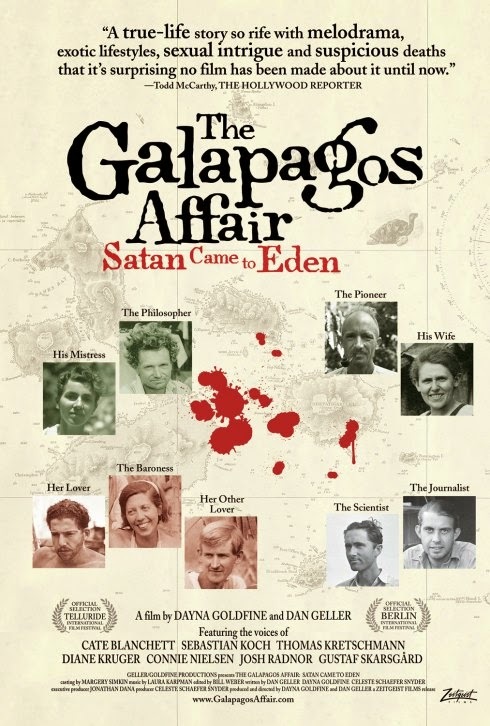 What exactly happened on Floreana remains a mystery, but Dana Goldfine & Dan Geller document the rivalries and resentments that presumably led to several premature ends in The Galapagos Affair: Satan Came to Eden (trailer here), which opens this Friday in New York. Some of the Galapagos Islands have a long history of human tenancy, but Floreana was not one of them. That was part of the appeal for Dr. Friedrich Ritter and Dore Strauch. They were married, just not to each other. Ritter assumed the remote and exotic locale would be the perfect place to openly cohabitate with his mistress while he wrote his grand philosophical treatise (which sounds like it would have been a warmed over synthesis of Nietsche’s Superman and Rousseau’s Noble Savage). Much to their consternation though, they attracted unwanted press attention as a modern day “Adam and Eve.” They also had to deal with unwanted neighbors. First, the Wittmers arrived hoping to build a new life as Twentieth Century homesteaders. Ritter and Strauch found them insufferably middle class, but they still stomached their presence as best they could. The Austrian Countess Eloise von Wagner Bosquet was a different matter. Her high handed manner and plans to develop a luxury hotel made her highly unpopular on Floreana, but the locals on the neighboring islands appreciated her charms. Although not a radiant beauty by contemporary standards, she had enough allure to simultaneously ensnare two considerably younger lovers. In retrospect, this arrangement was probably inherently unstable. The exact fate of the Countess and her preferred lover remain unknown, but it is presumed they met with foul play. Initial suspicion quickly fell on the remaining boy toy, especially given the speed with which he vacated Floreana. However, the discovery of his desiccated body on a desolate islet years later only raises more questions. In fact, death would return to Floreana after the Countess’s disappearance, but the memoirs of Dore Strauch and Margaret Wittmer paint very different pictures of the incident. Sort of like a Teutonic documentary analog of Michael Radford’s White Mischief, the scandalous drama of Brits behaving badly in 1940’s Kenya, Galapagos is fully stocked with vague hints of infidelity and presumed murder. In this case, the persistent mystery heightens the fascination with the case (or cases). By doc standards, it is unusually cinematic, particularly through its in-characters readings of the Floreana residents’ journals and letters by an all-star voice-over cast, including Oscar winner Cate Blanchett as Strauch, Diane Kruger as Margaret Wittmer, and The Lives of Others’ Sebastian Koch as Heinz Wittmer. Goldfine and Geller also discovered and restored a wealth of amateur film shot on Floreana, including a would-be feature film, shot by the Countess and some of the local sailors, showcasing her as a prospective adventure heroine—for real. 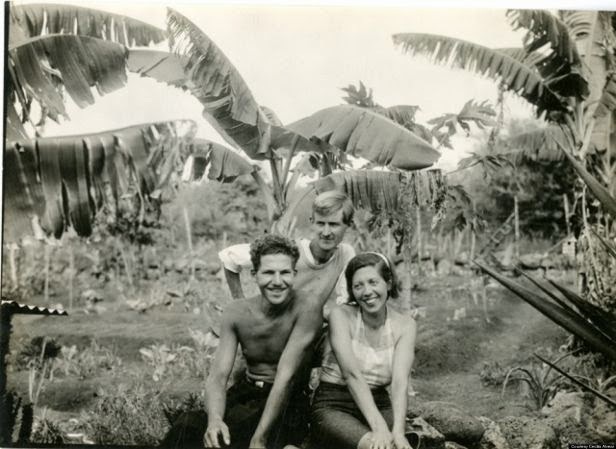 Goldfine and Geller chronicle an intriguing story and provide a good deal of useful historical context regarding the European expatriate experience on the Galapagos. However, they never directly address the concurrent rise of National Socialism in Germany (whereas Radford’s film pointedly contrasts the hedonism of Happy Valley with the resolute sacrifice of Londoners during the Blitz). Ironically, the Floreana expats would probably compare well against their countrymen in this limited respect. Still, Goldfine and Geller set the scene remarkably well and even build a degree of suspense as they recreate alternate versions of this murky business from some eighty years ago. Highly recommended for fans of strange-but-true documentaries and historical mysteries like Heat of the Sun (British Kenya again), The Galapagos Affair opens this Friday (4/4) in New York at the Lincoln Plaza Cinema.